This post contains affiliate links! Please click the book photo if you are interested in buying any. See my Affiliate Disclaimer for more details. As I mentioned in the previous post Ditch the Elf on the Shelf, Alternative Christmas Countdowns and “Santa is Watching” Traditions we love the Christmas storybook tradition in my house. It fits right in with our daily routine of reading before bedtime. I have one big wrapping session a few days before the first of December and then the kids love having a book to unwrap each night leading up to Christmas. I even add numbers so I am the one in control of which book is opened when! I compiled this list with all the Christmas stories in our house. I pack them away with the decorations each year. When its time for December first I make sure they are wrapped and under the tree for the kiddos to open one each night. As you may notice I have more that 25 here. That is because some are little baby board books, we are not ready to part with, so some wrap jobs have more than one book inside. I am going to do my best to include Amazon links for all the books if you click on their photo, as well as a little review of each. Some of these are OLD and/or I found in a thrift shop, so we shall see if they can even still be purchased. If there is not a photo link for the book that means Amazon didn’t have it. This book was given to us by my Aunt. Her kiddos received it from an Aunt and it has been a part of their tradition ever since. I am excited to start reading it each night with my kids this year! The book has a one page story for each night. It is our first book to open this year and we will be reading from this each night along with the new book. You could just use this for the story tradition if you don’t want to pack away 25 or more books each year. A retelling of Jesus’ birth but this time in Little Golden Book form. Here we have a very cute and simple version of Jesus’ birth. Great illustrations!!! 4. What Star is This? This book takes a more scientific approach to that same retelling but focuses more on the star in the story. My second favorite Christmas song. I always sing-read it with the kids. This book is a retelling of Jesus’ birth but in a poem-like format with words repeating. It can be compared to the 12 days of Christmas almost. My all-time favorite Christmas song. I always sing read this one too. This book has the most beautiful illustrations. 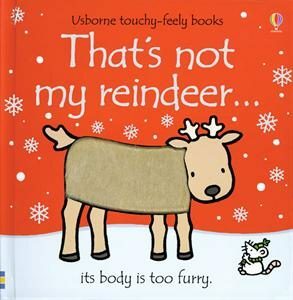 A classic and a must have in any Christmas library! A little simpler than the Tom Hanks movie recreation. Another classic here. There are so many beautiful versions of this little story/poem. I remember reading this most as a kid. Everyone knows this poem or song. We have 2 different versions of this book. One is a beautifully illustrated search and find. Each of the previous lines are hidden in the next illustration. A more condensed version with 4 puzzles included in the pages. I could not find this one on Amazon. Cute little scholastic book club book. This book is long so don’t double up on this night. It reminds me of the Corduroy stories but with Santa. Just super cute cat fun. We all know a cat lover who would enjoy this story of cats preparing for Christmas. This story talks about Santa as a Kid and I used it when I taught first grade. The kids can practice sequencing the story, main idea, main characters, setting, and really any comprehension skill you can think of. I like that they see him as a kid who makes mistakes just like they do. A good counting story and it’s from the scholastic book club. This is another cute cat Christmas story. He writes his Christmas list to Santa and has a hard time doing it honestly. He also tries to stay awake to see Santa but we know that never works for tired kids or cats. This story is another classic. It also showcases writing Santa a wish list and shopping for mom and dad. Found this book at the thrift shop. It is a fun surprise to look through and guess the festive Christmas clues under the flaps. Totally a Christmas classic. This story can be very long, and my younger kiddo doesn’t have the patience to sit and listen to it yet. It gets put with one of the board books. This was my son’s favorite author for a little while. I think it was because of the illustrations of him running down the street with no pants. We have all the David books and this one is cute. Cute little story about a polar bear standing in for a reindeer on Christmas Eve. Silly story about a papa moose who is way into the season and all decorating traditions, but he forgets the tree! In the end they use his giant mustache and he stands in for the tree. My kids LOVE this one. I always put it near the end because they want to reread it every night and it’s a lot. You could also use it as and advent calendar- it has one on the last page. This one again is a little long but features Santa getting a Christmas gift from the elves. The gift gets switched with a little girl’s gift and one of the elves saves the day and switches it before she notices. This is a creative take on the song Jingle Bells. This story is a holiday version of one of my favorite childhood stories. There is counting and cute puppies. These are two of our board books. They have pages to touch and feel different textures. 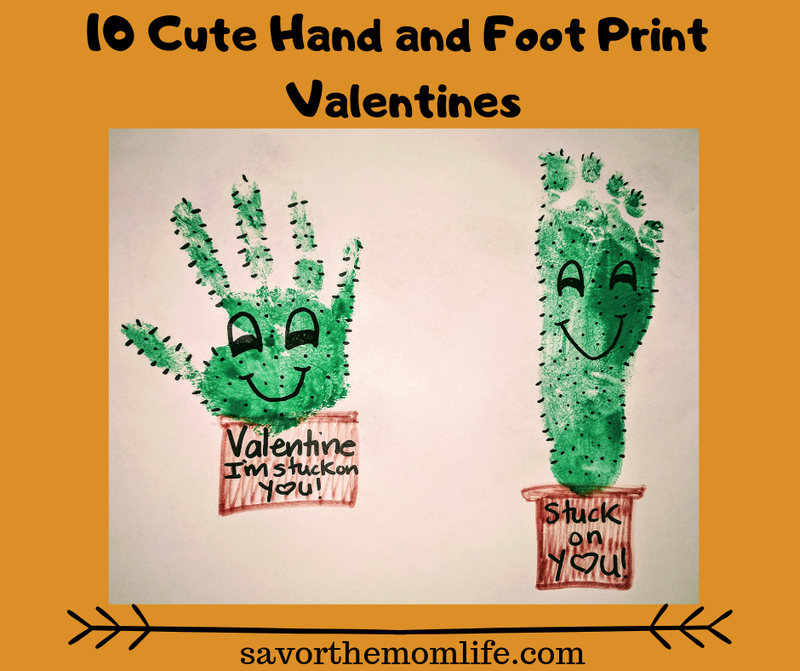 I almost handed them down to my nephew this year, but I know my 3-year-old will still love them! This is another board book. Very short with cute illustrations. 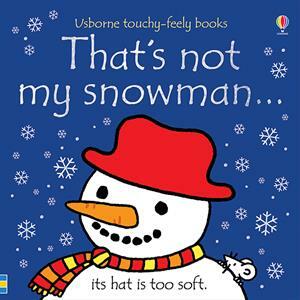 I am quite sure this was my sons very first Christmas story of his own. Probably will keep this one forever even after it goes out of rotation. Finally, this one is another board book and fun to read with a bag of M+M’s. The pages have little spaces to arrange the candy as you are reading. Please enjoy this big book list I have created for you. The library is a great place to check out books as well! With an extension you should be able to keep them for the month. I also recommend searching for Christmas books in thrift shops. And of course you can always follow my links here! 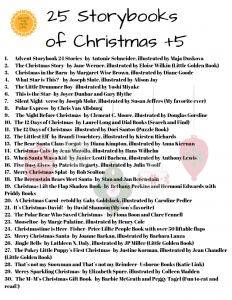 Please remember to subscribe and I can send you the wonderful printable list of these storybooks. You will also be receiving a monthly email with all the blogs and free downloads each month. Such a cute idea. I bet the kids are so excited!